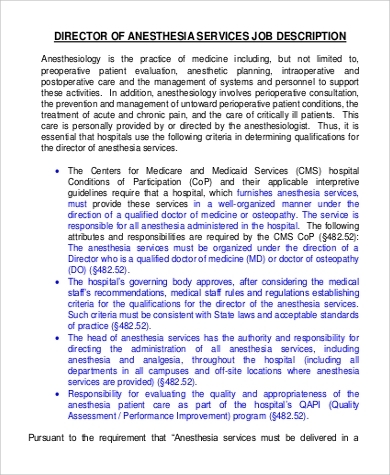 Anesthesiology is one of the most important functions in perioperative patient care. 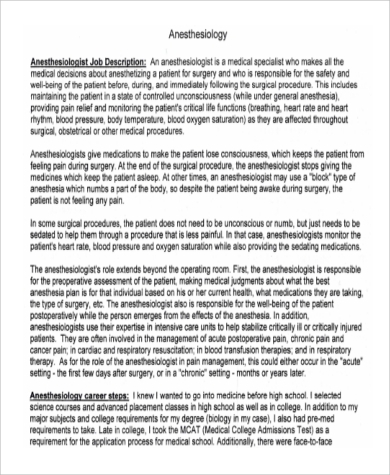 Unlike surgeons, anesthesiologists have to care for the patient before operation (preoperative), during operation (intraoperative) and after operation (postoperative). Anesthesiologists have the most important job of ensuring patient safety as well as helping them undergo operation as painlessly as possible. Through pain relief and making patients stable enough throughout the operation procedure, additional risks will be prevented like cardiac arrest, heart attack or stroke. 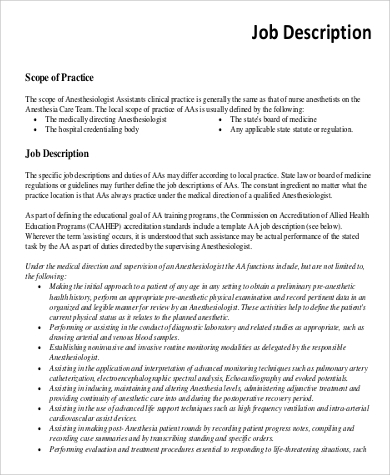 Our Anesthesiology Job Description Samples will help establish the parameters with which hiring an anesthesiologist will be defined through our downloadable forms. 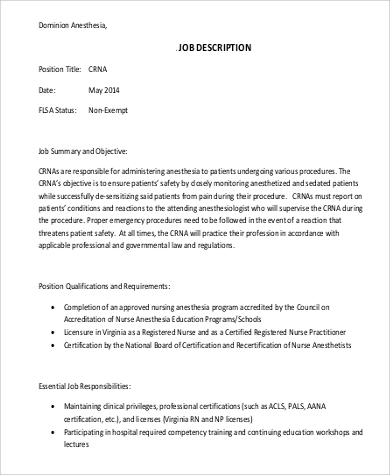 The drafts with which basic job descriptions are enumerated will help form the basis for editing or placing additional conditions when hiring an anesthesiologist. These are available in Microsoft Word DOC or Portable Document Format (PDF) files. 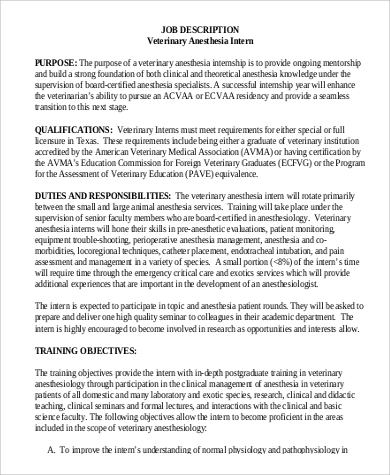 Job description includes performing resuscitations upon directions of a physician in life-threatening situations, monitoring patients’ vital signs, managing pre- and post-operative anesthetic care and ventilatory support and assisting the anesthesiologist in gathering patient data during pre-operative care. CRNAs have the primary responsibility of ensuring patient safety through close monitoring of their condition on various operating procedures. 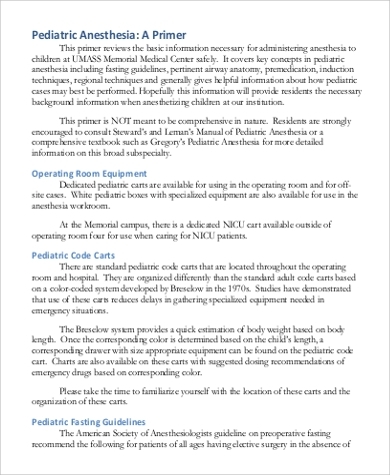 They must report on patient condition and reaction during the procedure and help in making patients less sensitive to pain throughout their ordeal. They must be well-trained in proper emergency procedures in case of any situation that threaten patient safety and stability during operation. 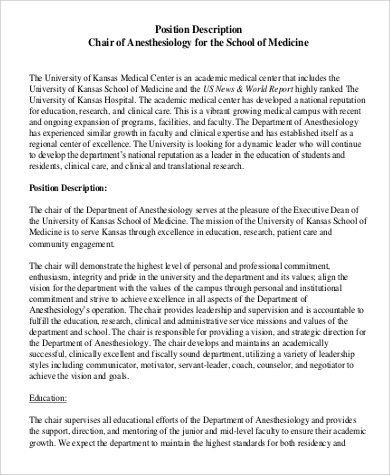 Responsible for setting up the anesthesia machine and all related equipment, plus run an inventory of all items related to everything the Anesthesiologist needs during an operation. 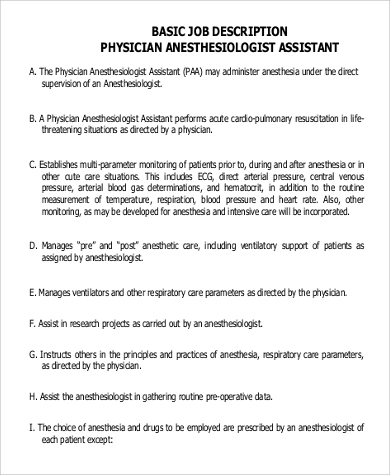 This site also offers Respiratory Therapist Job Description Samples for cardiopulmonary health care professionals needed for heart and lung infections. 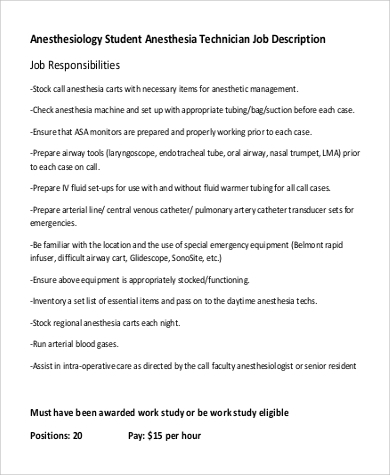 They are needed for patients who have trouble breathing and are usually seen working together with Anesthesiologists in the operating room. During the stage of pre-operation, developing a system of assessment and intervention is essential in an Anesthesiologist’s job. The aim is to lessen a patient’s suffering and develop pain management programs post-operation so recurring pain will not hamper their quality of life. While ease of pain and suffering are an Anesthesiologist’s ultimate objective, there are patients who undergo operations that need to regain their vital physical functions as well as cognitive skills needed for recovery. In some cases like extreme trauma due to an accident, there is permanent damage to the body where the patient’s healing process may either be slowed down or won’t recover totally. When pain management from Anesthesiologists are already taken cared of, Occupational Therapists are needed to help patients restore or develop independence after trauma due to accidents or injuries. Our Occupational Therapist Job Description Samples help in choosing the right people for the job particularly in stressful and traumatic situations where their expertise are needed. Occupational Therapists are needed to help patients get back on their feet and feel part of society again.